Redwork encompasses any type of embroidery worked in red thread on white or natural-colored fabric (usually muslin). This style of embroidery is most commonly worked in basic surface embroidery stitches and cross stitch. Redwork has been commonly used in folk embroidery since stable dyes were developed in Turkey (hence the old name of Turkey Work), and was very popular from 1880 through the early 1900s. DMC floss in color number 321 is the most popular color used for redwork. Redwork patterns can also be worked in blue threads on white fabric and are then referred to as Bluework. And while it's less traditional, you can work almost any pattern in a single color on any color background you like. It's no longer redwork, but this single color stitching is beautiful while taking inspiration from the original. Use these simple tips to help you create your next Redwork project. You'll find a guide for choosing a fabric, checking your floss to avoid bleeding, and more. The classic French rooster weathervane is one of nine great patterns you can choose, from classic to primitive to modern to adorable. If you're a history buff, you'll love learning a bit more of the history of redwork, along with blue work and blackwork. 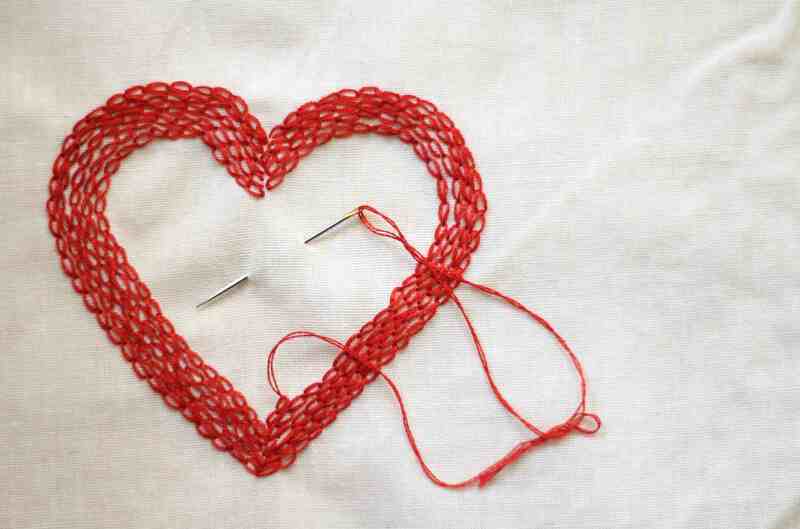 Embroidery Library, a site that sells patterns and files for machine embroidery, gives a great overview of the types of patterns used for this style of embroidery, as well as how and why redwork came to be. It's interesting to see how a method of stitching that started because of a lack of access to good supplies has continued into modern embroidery, including using a machine for the stitching! Quilters will enjoy making a free block of the month quilt using redwork techniques. Each of the 12 blocks features a different seasonal floral design. It's a great way to work on your embroidery a little at a time, while creating something beautiful and useful. If redwork isn't the color you're looking for in a quilt for your home, this is a great project to try working in a different color that's better suited for you! Mary Corbet of Needle 'n Thread is known for her amazing large-scale embroidery projects, typically featuring classic embroidery motifs. The projects often take a long time to complete, but as she works, she shares details at every step, giving others the opportunity to learn. Her Hungarian redwork table runner is a perfect example of her in-depth embroidery series', as she takes you through the process of a stunning redwork project over a collection of posts. Barbara Parrish has posted a wonderful assortment of free Redwork patterns featuring vintage scenes and motifs. Be sure to check out the main sections of the webpage for helpful redwork tips and information. This site features quite a few designs suitable for redwork embroidery. Most of the designs are whimsical and will fit nicely on a flour sack kitchen towel. The free patterns feature a variety of themes including Holiday and every day. This site features a number of vintage designs for redwork, including the Victorian era sentiment shown here. This design is part of their free redwork pattern collection, but they also have a large selection of other redwork motifs. Tipnut offers an entire series of Kitchen Proverbs for redwork embroidery. Proverbs include, A Watched Pot Never Boils, Too Many Cooks Spoil The Broth, and First Come, First Served, all featuring a girl in a bonnet going about her daily chores. While you're there, be sure to check out their other vintage patterns, many of which combine embroidery and cross stitch. Most will work perfectly for redwork!